Recently N.C. Cooperative Extension in Currituck County hosted its annual Extension Master Gardener℠ Volunteer Recognition Banquet to honor achievements during 2018. The Recognition Dinner was held on December 11, 2018, in the Elizabeth Sanderlin Auditorium at the N.C. Cooperative Extension, Currituck County Center in Barco. The 2018 year was marked by many positive changes in the organization. The Extension Master Gardener volunteer certification class was redesigned and offered in the evenings for the first time. The 2018 class graduated six students including Mike Del Acqua, Bill Kirkland, Paul O’Briant, Gretchen Pratt, Susan Merchant, and Jannie Lockhart. The greenhouse on site at the N.C. 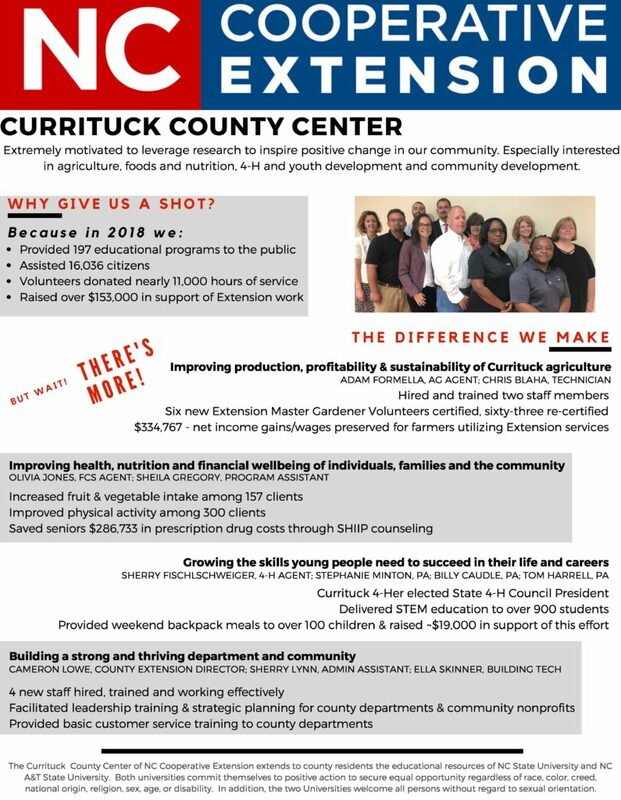 Cooperative Extension, Currituck County Center in Barco received much-needed upgrades in 2018. Finally, the Extension Master Gardener volunteers in Currituck County began work with the public library in Barco to plan a memorial teaching garden. Additionally, the traditional projects continued in 2018 which included the annual Currituck County Home, Flower, and Garden Show, community workshops, assistance to homeowners with landscape information and identification, continued maintenance and improvement of the public demonstration garden, and assistance with teaching aspects of horticulture to youth. 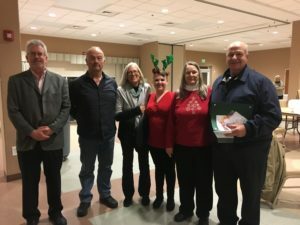 Master Gardener volunteer awards given included awards to volunteers who gave over 50 community volunteer hours in 2018, those with up to 500 lifetime volunteer hours, and those that have been involved with the program for over 5 years. The Recognition Banquet was concluded with the Master Gardener of the Year Award given to Ken Ferguson. 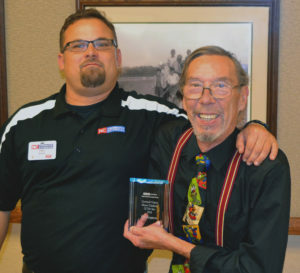 Mr. Ferguson was awarded this honor because of his invaluable assistance with coordinating the new Extension Master Gardener volunteer training course and other valuable volunteer service given to various projects throughout the year. If you would like more information concerning N.C. Cooperative Extension Service programs or the Extension Master Gardener volunteers inCurrituck County, please contact Chris Blaha at (252) 232-2262 or chris_blaha@ncsu.edu. • Are You Looking for Something to Do Over the Winter?